Let me start by stating that Chiropractic care is not a cure or treatment for any disease or condition. That being said, there is scientific evidence that shows spine health can effect thyroid function, therefore Chiropractic has potential to help people with thyroid issues. In fact, there is a case study published on this very topic. Follow the link below if you would like to read the abstract. 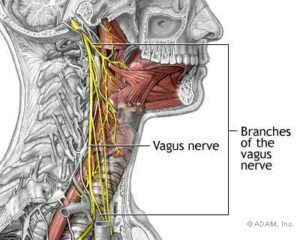 The thyroid is controlled by branches of the vagus nerve, which has a very close relationship to the spine. If one or more of the vertebrae (bones in your neck and back) are not moving properly, it could potentially cause a decrease signal of nerve conduction. This decreased signaling can lead to damage in the cells and tissues that are controlled by that nerve. Once the spine is moving properly, nerve signals can move freely between the brain and the rest of the body. This communication allows for the proper amount of hormones to be created by the body, so that it can function properly. Now that you understand the anatomy, let’s look at another case study. My father, who is now in his 70’s, was involved in a car accident when he was in his mid 30’s. Following the car accident he began to have neck pain and back pain. The pain wasn’t terrible, but it was almost always present. A few months after the accident he was diagnosed with hypothyroidism. He had no idea that the two might have been related until over 30 years later. When I became interested in Chiropractic, I encouraged my dad to start going on a regular basis to get his spine and nervous system checked out. He wasn’t too keen on the idea at first, but he went anyway. Quickly he became a fan of Chiropractic as it made him feel better! He made a commitment to get adjusted weekly and stuck to the routine. After two years of consistent care his neck pain was completely resolved. You may be thinking that it took a long time, but please recall this condition started over 30 years ago! Then something very interesting happened. Two months after his neck pain went away he had some blood work done at his MD’s office. He brought his results to me with some concerns. His thyroid hormones were elevated and he wanted to know what could have caused it? I quickly connected the dots. After 30+ years of neck pain disappears suddenly his thyroid starts functioning again! The new movement and proper position of his spine had allowed for the nerves to do their job at 100%! I advised him to talk to his medical doctor about decreasing his dosage of thyroid hormone. His body was starting to produce enough on its own. In conclusion I would like to reiterate that Chiropractic is not a cure for hypothyroidism, Chiropractors don’t treat conditions or disease. Even so, I know that by making sure your spine is moving properly you have the best chance for your body to function as close to 100% as possible. If you have any questions about thyroid issues or anything else health related please don’t hesitate to reach out. I started going to a chiropractor about 2 months ago for TMJ and hip pain. I was feeling GREAT! Just last week my TMJ and ear pressure went away. However, now I am having symptoms of hyperthyroidism. Symptoms that include muscle weakness and heart palpitations. Do you think the chiropractor care could have caused this? It’s making me very nervous about continueing my treatments. I would like your professional opinion about continuing chiropractic care and if you think that it may be apart of the retracing process? I am not aware of a case where Chiropractic has caused symptoms like those that you mentioned, however, I think you should listen to your body’s intuition. If you feel it may be related than you should discuss this with your Chiropractor and see if he/she can provide further insight. I hope this helps! He believes that it is a part of the retracing process sense I’ve had these symptoms in the past. I’m just going trust the process in hopes that he is right. I had blood work done and everything came back normal.